Cities contain valuable natural habitat that suffers from the pressure of urbanization. This three-part series of interpretive restoration walks enables participants to see first hand restoration efforts occurring in Greater Victoria’s “lost” streams to improve their value as natural habitat. Wattling to stabilize banks, removal of invasive species, planting native species to improve riparian areas, installing log weirs to create pools and riffles, cleanups, releasing salmon fry and the ultimate restoration practice of daylighting a stream are all occurring with the dedicated efforts of environmental groups, public volunteers, the Capital Regional District and municipalities. Instructors: Val Schaefer is the Academic Administrator of the Restoration of Natural Systems Program, School of Environmental Studies. Jessica Miles is a graduate of UVic’s Environmental Studies Program who is involved with project work for the RNS Program. They will be joined by a local expert for each stream. Note: Off campus locations. These are not strenuous walks but sturdy footwear, a water bottle and rain gear are recommended. 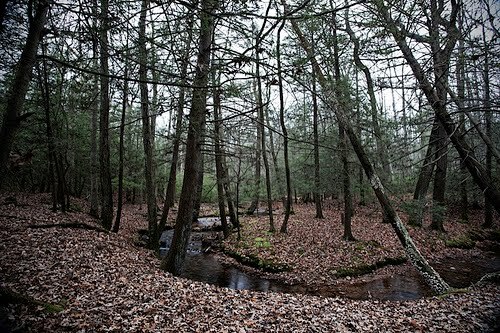 Read this 2011 post if you want to know the different levels of stream restoration! P.S. And what about these cool nature walks in Toronto: Lost River Walks! The view from the lake side toward the house is a seasonally changing mass of color, uninterrupted by paths. As I sit in the shade of 60-foot willow trees, on the shore of Trippe Lake, at the south end of a bit of land I call Green Gables, it is a sunny Labor Day, 2008. In spite of the 86-degree temperature, a cool breeze off the lake makes it an ideal setting for writing about our prairie garden. With the steady wind at my back, blowing away any mosquitoes in the area, I am looking at the golden glow of the blooming meadow in the center of our back yard. I have called it “our prairie garden”: A brief discussion of semantics may be in order. 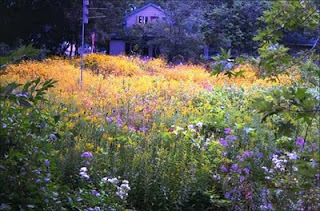 “Perennial prairie planting” has a poetic rhythmic sound which is appealing to one’s ears. Pragmatically speaking, it points out to a gardener reading this article that this is a planting of perennials, not annuals – and in fact an intended planting, not a natural occurrence. One of my fears while planning the yard, envisioned a city zoning officer responding to a neighbor’s complaint of my yard being full of weeds, to which my planned response would be, “This is a flower garden of perennial plants, no different from any other flower garden.” Then I would let the city employee try to figure out how to discredit my choice of perennials in comparison to another citizen who might choose all European or Asian perennials. An additional comment about patriotism in purchasing American-made plants might also be in order. The confrontation, fortunately never took place. Actually, I talked to the zoning officer during the planning phase and asked if there were any planting restrictions and was informed that people can plant whatever they like. The only regulation requires that lawns be limited to a certain height. I did receive a notice in the mail one time, no doubt prompted by a complaint from my lawn-obsessed neighbor to the east who has a $12,000 tractor with a three-point-hitch mowing deck for the large areas of his lawn, a $2,500 riding mower for tighter areas, and a $350 push mower for working around trees. The official communication stated I must remove all weeds in my yard or the city would do so and charge me for the cost. Since the notice was in no way specific as to which plants were in question, I replied in writing that the exotic weeds growing along the edge of my property were actually on city land and then indicated a willingness to pull them. No reply from the city ever materialized. Now for a brief discussion of Pragmatics: The term “prairie garden” is most appropriate when used for small prairie plantings in yards. Early on, I once referred to “my back yard prairie” – and a professional, who collects seed from prairie remnants, told me in no uncertain terms it was only a “prairie garden.” Feeling like I had been told, “You’re no Jack Kennedy,” I humbly apologized for the error of my exaggeration. Of course he was correct. Real prairies are thousands of square miles in size, and have many more naturally growing species of forbs and grasses than any yard can accommodate. 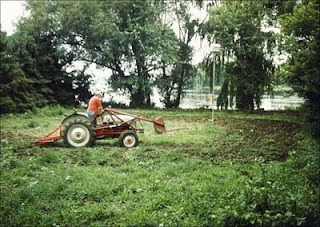 Or they may even be tiny “prairie remnants” of an acre or two of unbroken land, land that has never experienced a plow. And mine is neither. Mine is an intentional planting, on severely modified soil, of species of plants that may, long ago, have grown on a prairie. Speaking as an insecure male, I prefer the term “prairie planting” to “prairie garden”. It just sounds more masculine. Women do gardening – men plant things like crops, trees, shrubs, and such. In any case, our household’s prairie garden at Green Gables was designed to fill the whole center portion of the back yard. The landscape envisioned was one of a cohesive natural environment, one in which a person moves from a woodland setting to a prairie/savannah-like opening, and back to a woodland, while walking the length of the yard. I wanted to live within a nature preserve – a natural setting where plant communities come together. I wanted to create “ecotones.” Hence, the whole back yard lawn was replaced with intermingling prairie species that have been allowed to reseed themselves and thereby move around while interacting with each other, the soil, the moisture, and the dynamics imposed by the adjacent woodland. A friend with a small tractor that has a three-point hitch enjoyed breaking the sod and repeatedly tilling in the newly germinated weeds. The only path through the back yard is curved around the very edge of the prairie garden in order to have as little impact on it as possible. There is no arrangement of flower beds irregularly placed in the lawn or arranged with paths encircling them. Small planting beds have more edges than one large planting. More edges translate into less wildlife habitat and more maintenance. Lawn weeds migrate into planting beds. This is not what I wanted to create. Friends and family frequently comment on the bright colors and the masses of bloom that traditional, exotic gardens normally cannot match. The seasonally changing height adds to the interest, starting with thousands of blue, white, and purple 6-inch-tall violets, which start to bloom in late March. By mid-July the color has risen to an average height of 5 feet, and to the towering 7-foot cup plants (Silphium perfoliatum), scattered about. Daisy fleabane (Erigeron annuus), a volunteer native biennial, blooms for the longest period, from May to the end of August. Some years they appear in large masses, and in other years in the odd scattered cluster. Spotted touch-me-not (Impatiens capensis), another annual volunteer, has migrated from the shady, moist lakeside, where it first appeared as soon as we stopped mowing the lawn, into the prairie garden, and has freely become part of the colorfest. When dry weather comes, a sprinkler is sometimes used to assist their survival – their vase-shaped, dangling flowers provide nectar for the hummingbirds and butterflies. The attraction of our wildflowers is not limited to daylight hours. The constant movement and lightning flashes of fireflies at dusk and into the evening, from June to the middle of August, adds to our back yard activity and visual interest. Fireflies do not appear in my neighbor’s lawnscapes until the end of July, two months after having become very active at Green Gables. They apparently spill over after dry weather reduces my neighbor’s mowing schedule. When we moved into Green Gables 14 years ago, the back yard open space was all lawn, for which I had very definite intentions. A friend, Mark Kuhnke, with his Ford tractor and a three-point hitch cultivator turned over the thick sod and continued to cultivate the soil throughout the growing season of 1994, each time a new crop of weeds germinated. For a brief while, Roundup was judiciously used in spots to eliminate persistent weeds. Finally a prairie mix of seed was scattered and raked into the soil. Volunteers like daisy fleabane quickly appeared. Over the years rooted plants and additional seeds have been added. When common milkweed and goldenrod spread excessively they were uprooted around the edges of each colony, and other prairie seed spread in the place they had occupied. Each year Virginia creeper (Parthenicissus quinquefolia), spreads from the woodland planting at the front of the house, and needs to be removed each fall. Just prior to Thanksgiving, but after the birds have emptied the seed heads, we cut down the dry, dead forb stems instead of burning. Being in the city and having many evergreen trees surrounding the prairie garden discourages the use of fire. This year I will be trying a new approach in order to avoid the intensive labor of cutting and hauling to the city compost site. To chop the biomass a weed whacker will be used, starting at the top of the still-standing plants and working down the stems. This upper growth will be left to compost or reseed on site. A foot or two of standing stalks will provide continued habitat through the winter for both furry creatures and insects. The prairie garden has required more time and effort than the forest plantings in other parts of our yard – especially to get started. Incursion by sun-loving alien weeds is the primary cause of all the problems related to planting a meadow. Of course a traditional exotic-flower garden requires the same amount of effort and for the same reason. In a natural meadow planting, however, the native perennials, in time and with help, become dominant and begin to outgrow the weeds. Intervention and continual long-term maintenance will always be required by both. However, the continuous color and the wildlife activity in the prairie garden are worth the extra effort. At least it doesn’t have to be done behind or on the seat of a loud lawnmower. The work can be accomplished while listening to the sounds of nature. Even while we work in the yard, the prairie provides an ambience we prefer to the machine-intensive maintenance required by a lawnscape. Lodging occurs when the upper portion of plant growth, typically the seed head, becomes too heavy to be supported by the stem, and the plant bends toward the ground. In a prairie planting, tall grasses and forbs with substantial stems assist in preventing lodging. Ecotone: A transitional zone between two communities containing the characteristic species of each. Richard J. Ehernberg, of the Madison (WI) Chapter, is a landscape architect. Other chapters of his urban landscaping stories can be found here: Wild Ones (Wisconsin). I especially liked his story about his front yard forest and camouflaged natural drainage. "Dryer lint is soft and pleasant, and it is obvious why this might seem like a good idea, but it is not. Residue from detergent and dryer sheets can be irritating and toxic to naked young birds, and dryer lint tends to hold moisture exceedingly well, which can make the nest wet and cold, and actually increase mortality." "...we need to be particularly careful when driving toward crows that are eating in the road; while they would normally fly easily out of the way, they are more prone to miscalculation when absorbed in such meals... the actual truth is that they usually move. Usually is a potent qualifier - in the slender margin between usually and always lies an untold number of dead crows." "Birds raised by humans tend to be shunned by crow society - the essential crow life-support system that allows birds to find and share food, roosts, mates, protection from predators, and general good times. Without it, and coupled with a lack of proper wariness of humankind, these crows don't last long." P.S. 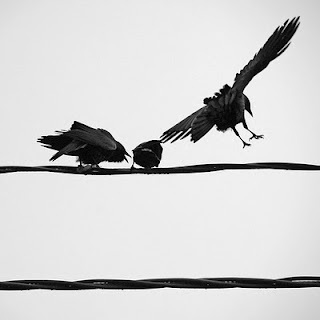 Read this post about local crow roosts and supportive urbanites! "the City of Red Deer will not remove or relocate the park's six to 12 beavers, because no beaver attacks have been reported since the weekend, said Trevor Poth, the city's parks superintendent. 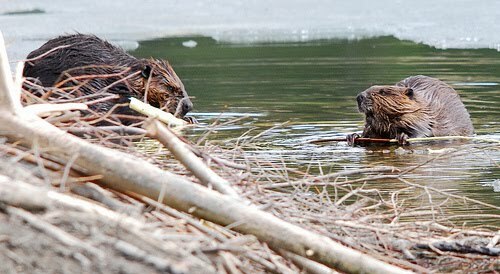 "We see no need to trap or relocate any beaver at Three Mile Bend at this time," Poth said in a news release. "We will, however, continue to monitor the situation at the park and educate park users." The city has installed more signs in the park warning people of aggressive wildlife and reminding dog owners to maintain control over their pets in the off-leash park." The Humane Society of the United States (HSUS) has a great resource on their website providing information on a little over twenty "wild neighbours" that we may encounter in urban areas. The beaver is one of those neighbours. This is a great place to learn more about these impressive creatures! In Ottawa, the Ottawa Carleton Wildlife Centre can help people with beaver conflicts. An article in their Spring 2010 newsletter, details how they worked with concerned neighbours in the Graham Creek area who wanted to learn how to live with the beavers rather than trap and get rid of them. The OCWC has also worked with Fletcher Wildlife Garden to help overwinter a visitor in their pond. c) raise awareness of the benefits of beavers in our ecosystem"
"Storytelling is an oral art form, so what better way to explore what storytelling has to offer environmental activism and education than through podcasts of interviews with storytellers..."
Professor Bill Freedman explains the environmental and aesthetic benefits to his grass-free lawn, made up entirely of native species in the heart of south end Halifax. Video by KM Productions.